Gametime for the Delta Boys Basketball game vs. Mt. Vernon at Bankers Life this Saturday is at 4:00 PM. The tickets that were sent to us and sold read 1:00 PM …which is incorrect. Congratulations to the 6th grade Boys Basketball team for winning the Delaware County Tournament Championship on Saturday. The Eagles defeated Yorktown 44-21. Blake Jones and Luke Jones scored 10 points apiece, Joey Ullom and King James added 6 points apiece. 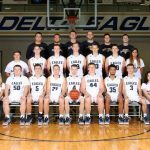 Multiple Teams · Jan 22 Delta boys JV defeats Hagerstown 49-43! 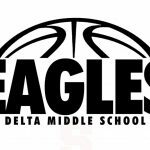 The Delta JV Basketball team defeated Hagerstown 49-43 on Saturday night. Leading the Eagles in scoring; Chase Gardner 19, Will Jones 18, Wesley Woodin 7, Mason Hunt 4, Zach Garner 1. Record 8-5 Next opponent: vs. Mt. Vernon Wednesday night at home. 6 pm! Multiple Teams · Jan 21 Delta Varsity boys basketball takes down 9th ranked (2A) Hagerstown 64-51!